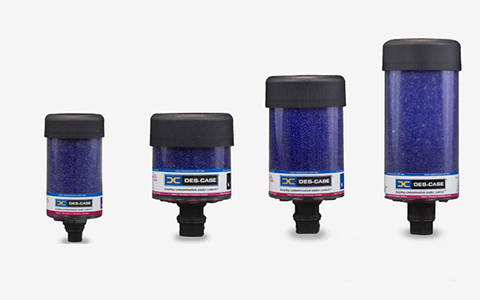 Des-Case’s wide range of products filter out pesky particles and moisture, keeping oil clean from the moment it arrives and is stored at your facility, during transfer and handling, and while in-use on your equipment. This means more up-time on your factory floor and less spending on oil and machine repair. 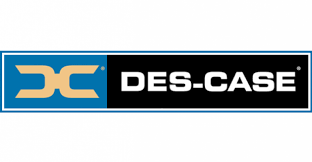 With desiccant breathers to fluid handling and filtration, visual oil analysis to lubrication training and consulting, Des-Case has the total solution to help you achieve lubrication best practices. As your industrial equipment heats up and cools down, it expands and contracts. And in order to keep machinery from building up too much pressure, equipment OEMs include vent caps on the fill port to allow expanded air to escape. With a wide range of sizes and features for almost any application and industry, Des-Case breathers simultaneously remove moisture from the head-space of equipment with silica gel and prevent even the smallest particles from entering your oil tanks with multi-layer filtration. With proper lubricant storage, transfer, and filtration equipment you can dramatically improve industrial equipment performance and lubricant life, preventing downtime and high machinery repair costs. 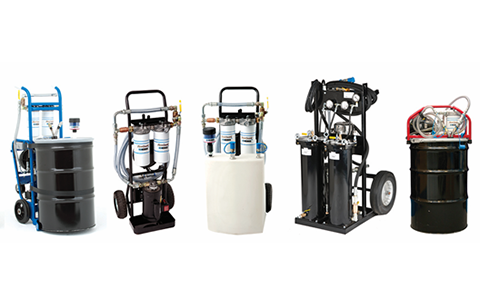 PORTABLE FILTRATION, DEDICATED FILTRATION, LUBRICANT STORAGE & HANDLING, VACUUM DEHYDRATION, ADAPTER KITS and FILTER ELEMENTS. Oil sight glasses and other visual oil analysis products play a critical role in early detection of contamination and oil level problems, and allow for constant monitoring of what’s happening inside equipment. These products are installed in the drain port of the oil reservoir of pumps, gearboxes, bearing housings, and other pieces of equipment. Des-Case offers models that accommodate both vertical and horizontal mountings, high temperature, large volume, and more, to be used on virtually any piece of industrial equipment that has a drain or port. Standard breathers provide simple, yet dependable protection from moisture and particulate contamination in lubricants and equipment. These versatile breathers are five times more effective than the leading non-desiccant breathers, providing optimal defense against humidity for your applications. Extended Series (EX) breathers combine the trusted materials and design of our Standard breathers with the check valves of our VentGuard and HyrdroGuard breathers, plus a new honeycomb technology oil mist reducing feature, higher air flows, and more than double the desiccant. The Extreme Duty (XD) breather has excellent vibration and impact resistance, can withstand broad temperature ranges, has expansive chemical compatibility, and features quality check valve technology while still accommodating higher air flow. The XD breather also has the best filter efficiency of our entire breather line capturing particles down to 0.3 µm absolute (β₃ ≥ 200). 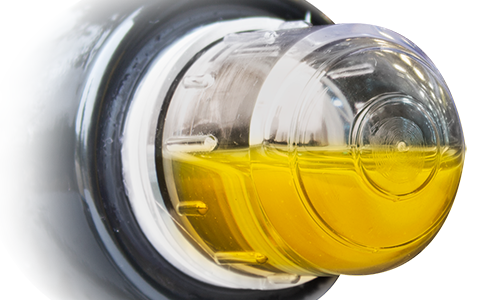 HydroGuard (HG) breathers uniquely feature an expansion chamber and internal check valves that create a nearly-sealed system. Designed specifically for steady-state operations with minimal temperature fluctuations, these breathers provide excellent protection in continuous duty applications. VentGuard (VG) breathers have check-valve technology that isolates the system and only breathes when necessary, making them an ideal solution to protect low-flow applications with intermittent operations. Check valves provide slight system pressurization that allows for controlled breathing without excessive pressure build-up. This control mechanism prevents premature saturation of the silica gel and extends breather life. Rebuildable Steel (RS) breathers were designed specifically for applications such as bulk storage tanks or large circulating lube oil systems with very high temperatures, extremely polluted air, or a corrosive environment. They are ruggedly designed with housings of powder-coated carbon steel or stainless steel. Rebuildable steel breathers accommodate large air flow rates with minimal pressure drops. Rebuild kits including a 1-micron pleated replacement filter element, desiccant bag filter, sight glass indicator, foam pad, and gasket which are easily replaced without removing the breather from service. Non-Desiccant (ND) breathers prevent contamination ingress in low-humidity environments or in applications where waterbased fluids are in use (e.g. water glycol hydraulic fluid). They help control contamination by preventing free water as well as particles down to 1 micron from getting into the reservoir.